The John and Griselda Lewis Printing Collection consists of over 20,000 examples of printed documents covering several centuries and a wide variety of research subjects –from Fifteenth Century religious texts, Nineteenth Century love tokens to Twentieth Century book design. It complements other important printing and publishing collections held at the University’s Special Collections Service and the Department of Typography and Graphic Communication. A selection of favourite items from the collection is currently on display here at the Museum of English Rural Life. John Lewis spent many years as a lecturer in graphic design at the Royal College of Art, and wrote several publications on printing and book design. His 1962 publication Printed Ephemera: The Changing Uses of Type and Letterforms in English and American Printing is considered pivotal in giving credence to the notion of paper ephemera as a subject for academic study. His interest in ephemera began as a young man. Lewis started his career as a printer for the firm of Cowells in Ipswich. While working here in the mid-1950s Lewis found a large scrapbook in a secondhand bookshop. The book contained an assortment of printed matter including printer’s marks, specimens of typefaces, tradesman’s bills and public notices. The scrapbook had been compiled in the 1820s by a Dr Lodge, at one time the librarian of the University of Cambridge. The exact purpose of the scrapbook remains a mystery, but John Lewis was compelled to purchase the book and study its contents. This original volume, which he later dissembled, formed the starting point of Lewis’s fascination with paper ephemera. In his collecting he was joined by his wife, the noted ceramicist Griselda Lewis. They believed that such temporary documents contain a wealth of evidence of everyday life in the past, as well as charting the development of printing techniques in the UK. In addition to John and Griselda’s original collection, a proportion of the archive was originally collected by the typographer and illustrator Berthold Wolpe, a fellow lecturer at the Royal College of Art. The collection was further added to by Ben Weinreb, a London-based dealer in rare books who purchased the collection sometime around 1990. What survives today is an amalgamation of the collecting interests of these various parties. The result is a rare and diverse collection of printed ephemera incorporating early printing specimens, newspaper advertisements, street literature, book covers and trade cards, plus specimens of calligraphy, lithography and fine art printing. 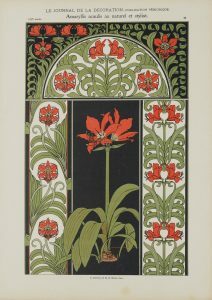 As such, material in this collection can support the research of many aspects of social history, as well as students of graphic design and the visual arts. 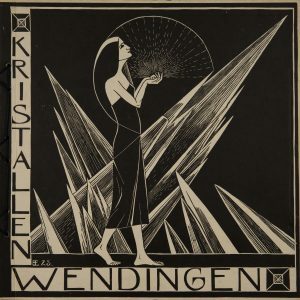 During his ownership of the collection, Weinreb arranged the documents into various categories. Roughly the first half of the collection is organised by document type. These include Early Manuscripts and Printed Books, Prospectuses, and Trade Cards, Letterheads and Catalogues. Much of the latter half is arranged by themes, such as Religion, Maritime, Agriculture, and so on, each of which contain a broad mixture of documents. The majority of documents were glued and mounted onto around 1,900 light cardboard sheets, presumably as an aid to displaying and discussing the collection. The collection is now fully catalogued, and is to be made available via our online catalogue. Each cardboard sheet has been digitally photographed. In addition, we are mid-way through a programme of conservation, as the glues used to mount the documents are harmful to their long term preservation. Documents are being carefully removed from their mounts and placed in archive-quality folders. This not only creates a better preservation environment, but also makes them easier for visitors to access in our reading room. In the short term parts of the collection are unavailable to researchers, but archive staff can advise enquirers as to specifics of availability. 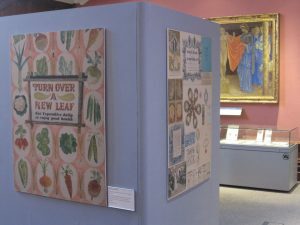 The John and Griselda Lewis Printing Collection is being celebrated with an exhibition here at our Special Collections Service, housed at the Museum of English Rural Life. This exhibition showcases a range of attractive and unusual documents from the collection, and runs until Sunday 11th February. A snapshot of our John and Griselda Lewis Exhibition.